Posted June 2, 2016 by Christopher Harris & filed under Bondi View, Featured Bondi View. 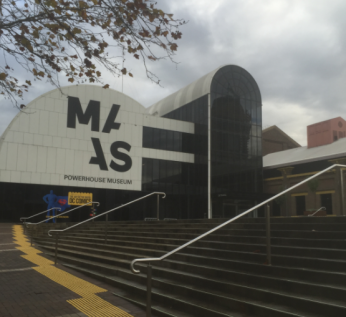 Sydney’s Powerhouse Museum is being shanghaied by Premier Mike Baird. The Liberal government’s plan to sell the current site to property developers and relocate the museum to a riverbank in Parramatta has little to do with ensuring cultural equity for western Sydney and everything to do with transferring valuable public assets, including prime inner city real estate into the hands of a wealthy few. Directly behind the Powerhouse Museum, massive cranes are towering skyward. Those cranes are one small part of Mike Baird’s plans to transform Sydney into the Shanghai of the South Pacific. Across the way from the newly redeveloped Goods Line, which links the Powerhouse to UTS and Broadway, large barricades have been erected behind the museum. On the other side of the fence, Lend Lease is busy building a new urban precinct on what used to be publicly owned land. Dubbed Darling Square, Baird’s developer mates are building $3.4 billion worth of high rises. Darling Square will ultimately comprise around 1500 apartments, student accommodation, 40 retail outlets, commercial offices, the new convention, exhibition and entertainment venues and a luxury hotel. Think of the billions to be made by Baird’s rich developer mates. In order to accommodate the massive Darling Square land grab, the Sydney Entertainment Centre, an entertainment complex on publicly owned land is being bulldozed and yet another cultural asset is being shanghaied. In its brief 35 year history, more than one million people each year poured into the 8,000 seat arena and everyone from David Bowie to Elton John played there. Thanks to Mike Baird and his developer mates, music fans will no longer be able to watch world class performances in the city centre, just a short stroll from Central Station. Instead they will travel out to the suburbs, some 40 minutes away to visit Sydney’s only remaining large scale entertainment venue: the Allphones Arena out at Homebush. And soon the Powerhouse will be shanghaied and moved westward as well. Baird will tear down Sydney’s first electrical power station dating back to 1890 and replace it with even more high rises. In the lead up to Australia’s centenary, the Ultimo Power Station was painstakingly adapted to house the Museum of Applied Arts and Sciences, which has had ties to Ultimo’s technical universities for over a century. More than 425,000 people each year visit the Powerhouse. One of the many furphies put forth by the Liberal State government is that the Powerhouse must be relocated to the western suburbs in order to accommodate the many school children who visit the facility. In actual fact, one quarter of the visitors to the museum are children. Many visit the museum when their family comes to Darling Harbour or on school trips bundled with other nearby facilities such as the Australian Maritime Museum, the Australian Museum and the Sydney Observatory. Far more visitors to the Powerhouse Museum are international, interstate and regional visitors, who make up more than one third of the visitors combined. Whether or not out of town visitors will make the hour journey west to Parramatta after Mike Baird bulldozes a one hundred and twenty five year old heritage building and replaces it with even more forty story towering apartment complexes is debatable. The proposal to relocate the Powerhouse Museum to Parramatta, is less about providing western Sydney with a cultural asset than it is about providing the property industry with as many redevelopment opportunities as possible. In Parramatta, cranes tower over Sydney’s second central business district as well. The riverfront area is currently undergoing an $8 billion high rise boom of its own and the Powerhouse relocation is part of a major redevelopment blueprint for the area. When and if the new Powerhouse Museum is built on the site of the former David Jones carpark, you can be sure, Baird’s developer mates will get the half billion dollar publicly funded contract to build the new facility. Baird is busy cramming tens of thousands of units into high rise buildings all over greater Sydney. No place is exempt. From Barangaroo, to Waterloo, from the Bays Precinct to Parramatta, high rises are sprouting up like mushrooms. Soon Sydney will have densities on a scale with Hong Kong or Shanghai. With apartments flooding the market, housing values are predicted to plummet and banks are becoming more and more reluctant to lend. The only people getting wealthy are Baird’s developer mates. It is not surprising that the most wealthy person in Australia, right at the top of this year’s BRW Rich List is a property developer. This year Harry Triguboff, the owner of the Meriton development juggernaut, has replaced Gina Rinehardt, as Australia’s most wealthy person. The fact that property developers are replacing mining magnates in terms of gross wealth, gives you an idea of just how much the transfer of public land into private ownership is enriching certain people. If you haven’t heard of the Free Enterprise Foundation, it is understandable. The fund was so secret that the finance director and treasurer of the NSW Liberal Party, Arthur Sinodinos claimed he was unaware of who actually donated money to the fund. The secretive nature of the Free Enterprise Foundation didn’t keep Australia’s third wealthiest man on this year’s BRW list, Frank Lowy from donating as well. The multi-billion dollar property developer and shopping centre magnate happily donated $150,000 to support the State Liberal Party’s neo conservative agenda to enrich the wealthy few by selling public land to private developers. While Mike Baird is busy transferring massive sums of public wealth into private hands, government spin doctors and the Murdoch media distract the rest of us with talk of petty cultural wars between the aesthetically disadvantaged outer suburbs and inner city elitists. After a hard day of selling off the public’s assets to his developer mates, Mike Baird doesn’t go home to a cramped high rise apartment to live cheek by jowl with the rest of us; he retires to a four bedroom house in North Curl Curl, with sweeping ocean views. Don’t believe what the Murdoch press tells you: the battle isn’t between Sydney’s east and west. It’s between the wealthy few whose fortunes are literally going sky high and the rest of us, who will be consigned to live on top of each other in Shanghai style high rises.